The Amps’ director of rugby said: “Coventry played extremely well, while we lost control and went completely off plan. “I don’t believe you can become a bad side overnight but a number of players need to take a long, hard look in the mirror and start taking responsibility for their own performances. 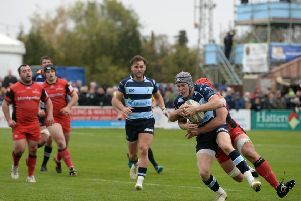 The A’s have had a inconsistent season, losing a number of close games while being competitive but that certainly came to an end at the Butts Arena when they where comprehensively beaten nine tries to two by champions -elect Coventry. The hosts broke the line on 11 minutes, scoring through Northampton Saints loanee Tom Kessell. Ex-Amps player Will Maisey added the extras. Coventry scored again on 27 minutes as lock George Oram cross for a converted try. Ampthill fought back, sticking to the game plan and scoring after multiple phases on 32 minutes. Scrum-half Kevin Barrett crossed unopposed after a scrum pick-up by Maama Molitika as James Pritchard converted. This was the signal for Coventry to take over and they scored two quick tries from Jack Preece and Kessell to make it 28-7 at half-time. The less said about the second-half the better but Coventry were accurate, direct and physical and took advantage of a very poor Amps performance to walk to a big win, scoring five more converted tries with just a single response from A’s wing Sam Baker on 73 minutes, converted from the touchline by Pritchard.